The nylon acoustic (Classical and Flamenco), the steel-string acoustic (folk) and the electric. Acoustic guitars produce sound due to a rather complicated interaction (or "coupling") between the various components of the instrument. (See Resonant Guitar Modes.) From here on, the word 'guitar' will exclusively refer to the acoustic guitars only. 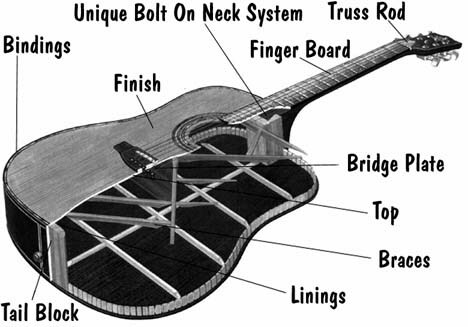 Note that guitar terminology is by no means fixed or completely standardised---The soundboard is often called the 'top-plate', and the sides are often called the 'ribs', for instance. Nylon guitars usually have rather rounded bodies and the neck joins the body at half the effective string length (12th fret). The finger board is relatively wide (about 60mm at the body) and the top three strings (highest pitch) are made of nylon and the lower three are generally composite (silver-plated copper wire wrapped around a silk fibre core). The steel-string guitar family tends to have a little more geometric variation than the nylon guitars. Most models have the neck join the body at the 14th fret, to increase the fingerboard's effective length. The strings are usually either steel alloy or bronze. An example of a classical. An example of a OOO ("Triple-O") steel-string. Examples of: a Dreadnaught. The OO ("Double-O"), or the Jumbo. These guitar web pages were written by Ra Inta as part of a PhD project at the Musical Acoustics Laboratory at UNSW, Sydney, and the Gilet Guitars workshop. It is dedicated to pickers, pluckers, strummers and acoustophiles everywhere.